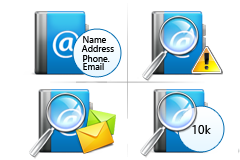 With the help of WAB Viewer Tool, one can view all the Windows Address Book contacts. After adding the file, the software will list all the contacts in an alphabetic and symmetric order. If there is a contact with no alphabet then those get arranged in another category. The WAB Reader Application is developed with a simple interface. There is a single panel interface that does not clutter with unknown functionality and has been designed in a user-friendly and simple by keeping in mind all the specific needs of the purpose. There is no restriction on the size of the WAB file. 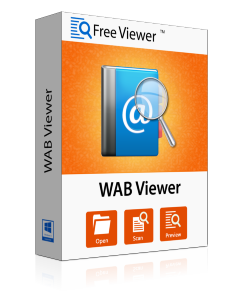 WAB File Viewer allows a user to add multiple WAB files at a time of any size and the software will show each and every contact within the file. WAB Viewer provides a Search feature through which a user can search for any specific contact by adding contact name or any word related to the search. After that, one is directed to specific contact instantly. The WAB Reader comes with a host of features that enables a user to view name, phone number and email address of all the users instantly. Easily scan and preview contacts with each and every associated attribute. Even if all your contacts exceed 10k in number, then also you will be able to view all the WAB File contents. The WAB Contact Viewer allows a user to Search through thousands of contacts instantly. You can even filter the result by providing the parameters that you are looking for to find the exact contact. Explain the working of WAB Viewer Software? Step 1: Install & run WAB File Viewer Tool. Step 2: Click on Browse button to add the WAB file. Step 3: Browse the location and select the WAB file and click on Open button. Step 4: After that, click on Scan Contacts button to scan all the contacts within the file. Step 5: Click on OK button after completion of the scanning process. Step 6: Now, you will get a list of contacts. You can open each contact and view the details. What is the recovery rate of the corrupt WAB files? In most of the cases, WAB Reader software will give back every contact that exists within the .wab files. So, unless the wab files are extremely corrupt, one can get all the contacts back with all the information intact. What are the limitations of the WAB Viewer Application? There are no as such limitation but as the name implies the purpose of the application is to help a user to browse all the contacts that exist within the application. What are the software compatible operating systems? WAB File Viewer software is primarily designed to work on Windows Operating System and is compatible with all the versions of it. So, if you are running Windows XP, Vista or the newer generation of Windows OS system i.e Windows 7, 8 and 8.1, 10, you will be easily able to run it on your system. "Great tool and comes with so many features! WAB Viewer still works when there is no Outlook Express installed on the machine. The software gives all the information without missing and losing anything. Work exceptionally well and is recommended to anyone who wishes to see their Windows Address contacts." "After migrating from XP to 7, I need to access my contacts immediately but could not since Outlook Express was not installed on my system. To overcome this issue, I installed WAB File Viewer software which helped me in viewing all the contacts that I wanted. Thanks for the tool!" "I was unable to access my Windows Address Book Contacts on my Windows machine. Then, I used FreeViewer WAB Reader to open and scan multiple WAB files. I got surprised with the positive results by the tool. Now, I am able to view details of all the contacts on my system anytime." "As a non-technical user, I was completely unaware of the WAB file as well as methods to access the contacts. Then, one of my friends explained me about the file and suggested me WAB Viewer Tool. Now, I am able to access all my contacts only with the help of this tool. Thanks, FreeViewer for such a great application."